The US presidential rivals have begun campaigning in earnest, as a new opinion poll put Republican John McCain ahead of Democrat Barack Obama. Fresh from being nominated at their party conventions, the two men are now gearing up for the 4 November poll. A USA Today-Gallup poll put Mr McCain ahead for the first time in months. Candidates often see a bounce in the polls after the conventions but Mr McCain’s choice of Sarah Palin as running mate is being seen as key. Mr McCain has tried to strike a balance between distancing himself from an unpopular presidency and rallying the party’s conservative base. Mrs Palin wowed the Republican convention crowd with her speech, helping to re-energize his campaign. Mr McCain said that “the electricity has been incredible” at rallies ever since he invited the Alaskan governor to join his ticket. “She has excited people all over the country. I would love to say it was all because of the charisma of John McCain, but it is not,” he told CBS on Sunday. Mrs Palin will face a major test this week when she gives her first nationally televised interview, following intense media scrutiny over her personal life and credentials for the ticket. The USA Today-Gallup poll, which was released on Sunday, showed Mr McCain leading Mr Obama by four percentage points, 50 to 46. A USA Today poll taken before the Republican convention showed Mr McCain trailing Mr Obama by seven points. The latest poll had a margin of error of plus or minus three percentage points. The results of a Reuters/Zogby poll, also released over the weekend, gave Mr McCain the edge, with 50 percentage points to 46. The Rasmussen Reports daily Presidential Tracking Poll showed John McCain with a one-point lead. 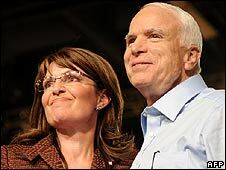 Mr McCain and Mrs Palin are scheduled to be in Missouri on Monday. Mr Obama is campaigning in the crucial swing state of Michigan. His vice-president, Joe Biden, was appearing in Wisconsin and Iowa, while Hillary Clinton is on the campaign trail in Florida. Despite the frenetic pace of the presidential race, the candidates will stop campaigning on Thursday to appear together in New York on the anniversary of the 11 September 2001 attacks. They said they would put aside politics to honour the memory of the nearly 3,000 people who died. Hong Kong’s pro-democracy camp has won more than a third of seats in elections in the territory, and so retains a key veto over future major legislation. The pro-democracy opposition won 23 out of the 30 elected seats in the Legislative Council. The other 30 seats in the council are not directly elected, but allocated to special interest groups. The Pro-Beijing camp had expected to make gains at the polls due to a surge of patriotism after the Olympics. In fact, even some people on the pro-democracy side had been predicting that they would suffer heavy losses. Some candidates issued statements on Sunday saying the situation was critical. Others were in tears, expecting to lose. Analysts had believed pro-government parties would make significant gains after the surge in pro-China patriotism sparked by the Beijing Olympics and the Sichuan earthquake. China had also promised the region some form of universal suffrage by 2017, blunting the democratic camp’s campaign. 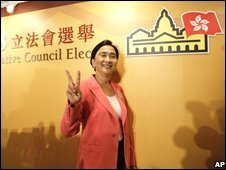 Leading figures such as Emily Lau, Audrey Eu and Leung Kwok-hung, also known as Longhair, each fought off stiff competition to keep their seat. The pro-government party, the Democratic Alliance for the Betterment of Hong Kong, or DAB, has also done well, thanks to its strong organization. And the pro-China independent Regina Ip won her seat. But the pro-business Liberal party leader, James Tien lost his, and has resigned. The US presidential rivals, Barack Obama and John McCain have said they will appear together on the anniversary of the 11 September 2001 attacks. The senators said they would take part in the commemorations in New York – the site of two of the attacks. The two candidates said they would put aside politics to honor the memory of the nearly 3,000 people who died. Hijacked planes were crashed into New York’s Twin Towers, the Pentagon in Washington and a field in Pennsylvania. “All of us came together on 9/11 – not as Democrats or Republicans – but as Americans,” the joint statement said. “In smoke-filled corridors and on the steps of the Capitol; at blood banks and at vigils – we were united as one American family. 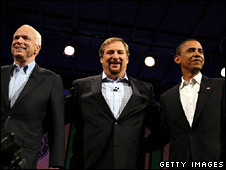 The event at Ground Zero – site of the collapsed Twin Towers of the World Trade Center – will mark the first time Mr McCain and Mr Obama have been together since they were formally nominated as presidential candidates at their parties’ just-completed national conventions. The two agreed not to run television ads critical of each other on Thursday and Mr McCain’s campaign team said they would not run any ads. With the parties’ nominating conventions over, the candidates have been gearing up for the last weeks of campaigning up to the 4 November election. Criticism by the G7 group of nations of Russia’s actions in Georgia is biased and groundless, Russian officials have said. The G7 was trying to justify Georgian aggression towards the breakaway regions of Abkhazia and South Ossetia, Russia’s Foreign Ministry said. The G7 had accused Russia of breaking international law by recognising the two provinces as independent. Russia and Georgia fought a brief war earlier this month over the issue. The ministry accused the G7 of making “baseless assertions about Russia undermining Georgia’s territorial integrity”. “This step is biased and is aimed at justifying the aggressive actions of Georgia,” the ministry said. 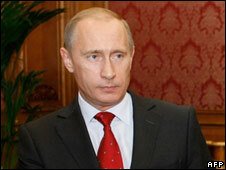 The new statement comes a day after Russian Prime Minister Vladimir Putin stoked up the war of words with the US. He told CNN there was a “suspicion” that the Georgian conflict was created by someone in the US in the hope of benefiting one of the candidates in the presidential elections. The White House dismissed Mr Putin’s assertions as “not rational”. Meanwhile, officials in the Moscow-backed South Ossetian government have been quoted as saying Russia intends to absorb the breakaway province within “several years”. Parliamentary speaker Znaur Gassiyev said the move had been agreed at high-level talks in Moscow earlier this week, the Associated Press reported. The Kremlin has not yet commented on the claims. Russian Prime Minister Vladimir Putin has accused the US of provoking the conflict in Georgia, possibly for domestic election purposes. Mr Putin told CNN US citizens were “in the area” during the conflict over South Ossetia and were “taking direct orders from their leaders”. He said his defense officials had told him the provocation was to benefit one of the US presidential candidates. The White House dismissed the allegations as “not rational”. Georgia tried to retake the Russian-backed separatist region of South Ossetia this month by force after a series of clashes. Russian forces subsequently launched a counter-attack and the conflict ended with the ejection of Georgian troops from both South Ossetia and another rebel region, Abkhazia, and an EU-brokered ceasefire. Mr Putin said in the interview: “The fact is that US citizens were indeed in the area in conflict during the hostilities. Mr Putin added: “The American side in effect armed and trained the Georgian army. “Why… seek a difficult compromise solution in the peacekeeping process? It is easier to arm one of the sides and provoke it into killing another side. And the job is done. White House spokeswoman Dana Perino rejected the allegation. “To suggest that the United States orchestrated this on behalf of a political candidate – it sounds not rational,” she said. Diplomatic wrangling over Russia’s actions in Georgia continued on Thursday with the Georgian parliament urging its government to cut diplomatic ties with Moscow. Earlier, French Foreign Minister Bernard Kouchner suggested some EU countries were considering sanctions against Russia. Mr Kouchner insisted France had made no proposals for sanctions itself but, as current president of the EU, would aim to get consensus among all 27 countries of the bloc if sanctions were envisaged. France has called an emergency EU summit on Monday to reassess relations with Russia. Russian Foreign Minister Sergei Lavrov described talk of sanctions as the working of “a sick imagination”. Such talk was an emotional response that demonstrated Western confusion over the situation, he said. The US has said it is now considering scrapping a US-Russia civilian nuclear co-operation pact in response to the conflict. “I don’t think there’s anything to announce yet, but I know that that is under discussion,” Mr Perino said. The White House has also announced that up to $5.75m (£3.1m) will be freed to help Georgia meet “unexpected and urgent refugee and migration needs”. Earlier on Thursday Russia failed to get strong backing from its Asian allies over the Georgia conflict. The Shanghai Cooperation Organisation (SCO), comprising Russia, China and Central Asian nations, met in Dushanbe, Tajikistan, and spoke of its deep concern. The group did not follow Russia in recognising the independence of South Ossetia and Abkhazia. Russian President Dmitry Medvedev insisted he had the backing of the nations over Moscow’s actions. Amid the rising tension, Russia announced on Thursday it had successfully tested its long-range Topol ballistic missile from a launch site in Kamchatka in the far east of the country. Russia says the rocket is capable of penetrating the proposed US missile defence. If Barack Obama wins his way to the White House, one quiet decision may turn out to have been crucial. Towards the end of June, he announced that he would not participate in the system of public funding for elections in the United States. That means he can raise – and spend – perhaps $300m (£150m) compared with the $84.1m (£43.6m) that Mr McCain will get from the tax-payer under the public funding system. Under the rules, candidates who take public funding for the general election have their spending capped. 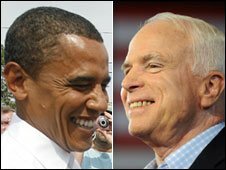 Accordingly, Mr Obama will be free to spend – Mr McCain will be constrained, although he will be bolstered by the Republican National Committee, which has far more money than the Democratic National Committee. Tad Devine, who was one of the main strategists for John Kerry in 2004, told the that Mr Obama had learnt from the “swift boating” that floored the Democratic contender. Mr Obama had indicated that he wanted to stick with the public funding system. Renouncing it, accordingly brought Republican allegations of an about-turn. Mr Devine, a Democrat, sees it differently. “It’s a testament that this guy can make tough choices,” he says. Democrats are still smarting from the mauling they got from the Swift Boat Veterans for Truth. They were a group of individuals who formed what is known as a 527, after the clause in the tax code that applies to such advocacy groups. Under the rules, these 527s cannot be connected to a campaign. But a connection to a campaign can be ambiguous, and where there is ambiguity there will be lawyers. Overlooking the corner of M Street NW and 26th Street in Washington DC is the office of the lawyer for the Swift Boat Veterans for Truth and for the Bush-Cheney campaign. He is one and the same man, Benjamin Ginsburg. He told me: “There was not a direct link. The truth is that I provided legal functions for them. Mr Ginsburg is a charming man with a mind like a laser. His office is a museum of mementos of big historical events in which he has been central. In one corner, there is a metal voting booth from Palm Beach County in Florida in 2000, complete with chads, those small bits of paper – small bits of contentious paper – on which the presidency turned. He is a great defender of 527s, the outside groups that are raucous and unpredictable in elections. Another Republican, Michael Toner – who used to be chairman of the Federal Election Commission, which polices elections – says the imbalance in funds this time shows that the system is not working. He wants more money to be available to candidates who take public funding. Americans do not spend too much on elections, he thinks, but too little. “Americans spent $3bn (£1.5bn) last year on potato chips. Isn’t the next leader of the free world worth at least that much? Democrats tend to see Swift Boat Veterans, and the campaign they ran last time, as way below the belt. Republicans, in return, see it as pretty fair game and point their fingers back at campaigns run by MoveOn.org in particular, which has depicted the US military leader in Iraq, Gen Petraeus as General Betray Us. Move On is a big web-based organisation that does take much money from ordinary people but also in the past from billionaires like George Soros. Ilyse Hogue, MoveOn’s campaigns director, defended the adverts. “MoveOn is member-driven, small donor driven. Over the past ten years, 90% of our fund-raising has been from small owners. The current average donation is $42 (£21). One of the benefits for Mr Obama of raising his own money rather than relying on public funding may be that he can keep better control of his own message. The reasoning runs that there is little point in giving to candidates if their spending is capped. Why give what cannot be spent? So his hope may be that giving to his campaign directly might seem more effective for his supporters than giving to fringe groups. So runs the argument. If that is so, he will be better able to meet whatever gets thrown at him, by fringe groups implying that he is a Muslim, for example. “They will try that,” says Harold Ickes, one of the legendary political workers in Washington for the Democrats and formerly deputy chief of staff at the Clinton White House, where he earned the appellation “Garbage Man” because of his role as a cleaner up of political mess. And race may surface – not formally from the McCain campaign, but from the outside groups. The first part of Steve Evans’s two-part investigation into the “The Billion Dollar Election” is broadcast on the World Service on Monday 4 August.